Childhood Neuroendocrine Cancer – 1 in 7 million! 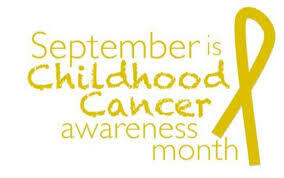 September is Childhood Cancer Awareness Month! The newspapers and social media will no doubt be featuring many child cancer articles and I notice the UK’s top soap Coronation Street is already featuring such a story. I personally cannot begin to imagine what it must be like to be a parent who has a child with cancer. I would just hope my child would be placed into the care and safe custody of experienced medical teams and would be able to get access to the best treatments available. I don’t know that much about Childhood cancers but the Cancer Research UK site has a nice summary on this page. You will note that over half of childhood cancers are either Acute Leukaemias or Brain Cancer. I do know a lot about Neuroendocrine Cancer and although you can develop it at any age, it does tend to be associated with those in later life with many statistics quoting ages in the region of 40 – 60 years at time of diagnosis. So childhood Neuroendocrine Cancer is uncommon. I recently had my survivor story (in the form of my blog) published by Carcinoid Cancer Foundation. I was hoping to inspire people through my own story but ended up being inspired myself after discovering a survivor story from an eight year old who had a Neuroendocrine Tumour (NET) of the Appendix. As a group of Cancers, I personally don’t believe Neuroendocrine based cancer is that rare but according to the survivor story, only 1 in every 7 million children will be diagnosed with a NET …… now that is rare! Check out the story here. Children really are resilient and hopefully the medical team have caught this NET early enough for little Emily to lead a normal life going forward! The article not only put a smile on my face but gave me the inspiration to generate this blog. Please help spread awareness by sharing this blog. Author Ronny AllanPosted on September 3, 2014 April 8, 2016 Categories GeneralTags Appendix, Awareness, Blogging, Carcinoid Cancer Foundation, Childhood Cancer, Inspiration, NET Cancer, Neuroendocrine Cancer, Neuroendocrine Tumour3 Comments on Childhood Neuroendocrine Cancer – 1 in 7 million!